This is the 1st time in 2 years and 103 days that I have eaten any form of pasta! I did it- I broke my oath for this Konjac linguine. This looks, feels and for me- resembles pasta in every which way. I gorged lol! I tried to eat just half but you know what.. I’m only human! This seemed to good to be true.. what was the catch? Would I be hungry again? Knowing my vegan self.. probably! This fast metabolism was absent my entire life! If you told me at any point in my life that I could restrict and/ or change my eating and eating habits for one year- and then be able to eat like I eat now– I would either not believe it or have become very happy health-wise many years prior! So I waited 30 minutes to see how I would feel- I was actually still satisfied! In any case, let’s take a walk down calorie isle for a moment. There were zero calories in the linguine- I know- INSANE! However I had 2 portions of which could be less than .5 calories times 2- so one calorie lol! 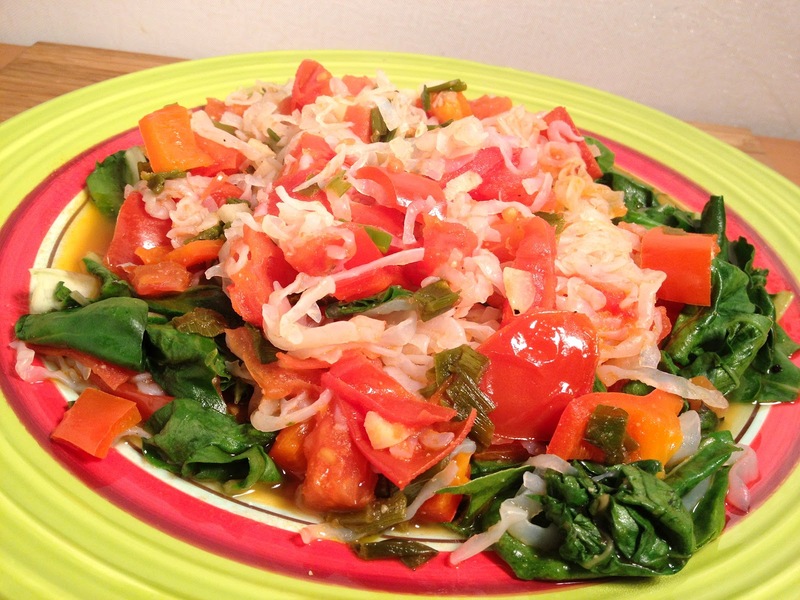 Plus I had tomatoes, scallions, garlic and swiss chard- can’t be more than 40-50 calories there. Then.. drumroll.. olive oil! Yes “healthy” olive oil- extra virgin at that- that rolls in at 120 calories! If I am going to get charged 120 calories for olive oil- you better believe I am eating or sipping down every last drop. Monounsaturated fat.. bring it on! The package says sugar free, fat free, gluten free, soy free, organic and vegan! They even boast about being guilt-free, but honestly- I still feel guilty. My meal was about 170 calories and I literally pigged out on a double portion! Reality check- the meal was fine; delicious and low in calories! I was able to incorporate greens, vegetables, herbs and a healthy fat- sure I could have added protein too if I wanted. All jokes aside, this was amazing although a double portion of anything is still not really necessary for reasons of habit and overindulgence. The stomach is only so big so why stretch it out when you are eating consciously for health- not necessary! Konjac glucomanna (KGM) is a water soluble plant fiber- each serving I had was 36% fiber and 20% calcium! I have to go now to order this in bulk!